A sci-fi mystery from the creators of Gone Home. A smart and thoughtful science fiction mystery featuring a cast of believable, nuanced characters. What is it? A sci-fi mystery set aboard a space station. Drifting somewhere between the Earth and the Moon, the lunar transfer station Tacoma lies empty and abandoned. An incident has forced the crew to evacuate and you, Amy Ferrier, have been sent to investigate and recover its omnipresent AI, Odin. But even though the six people who ran the station are long gone, their presence is felt all around you. And not just because of the empty coffee cups, photos of loved ones, and other traces they left behind, which make the station feel like a sci-fi Mary Celeste. Venturis, the corporation that owns Tacoma, has 3D recordings of every second of the crew’s year aboard the station, which you’ve been granted access to. And it’s through these ghostly memories, relived through an augmented reality viewer, that you’ll learn about the people who lived and worked there before the accident. It’s a mystery that grabs hold of you the instant your magnetic boots clamp to the station and never lets go. When you first float into Tacoma’s zero gravity hub, an area you’ll revisit often, a procession of bulkhead doors open one by one to reveal a long, rotating corridor stretching into the distance. It’s an evocative introduction to the station, and an early example of the game’s exquisite world-building. I suddenly feel a powerful urge to explore, but also a flutter of unease and trepidation. A mood that developer Fullbright, whose debut game was the equally mysterious Gone Home, has proven to be particularly adept at creating. The eerie calm is broken only by a cleaning robot occasionally buzzing past my head, still dutifully performing its chores in the crew’s absence. Around me there are colour-coded doors leading to different areas of the station, branching off from the hub like spokes on a wheel. But until I fulfil a certain objective, most are inaccessible to me. The game methodically guides you from one location to the next to tell its largely linear story, which can be stifling at times. I would have liked just a little more freedom to explore. The first wing of the station I can access is Personnel. Now pinned to the floor by artificial gravity, I walk into a communal dining area and an AR recording flickers to life. A timeline appears on the HUD allowing me to scrub through the memory, pausing, rewinding, or fast forwarding at my leisure. The crew, represented as digital silhouettes, are preparing for a party, and I’m immediately struck by how believable the dialogue is. It has a natural, conversational flow, never feeling contrived or overly expository. The crew, despite appearing to Amy only as faceless, transparent figures, have nicely rounded personalities. This is thanks to the game’s impressively expressive animation and superb voice acting, which combine to create characters who buzz with life. At first the recordings don’t seem to be anything more than elaborate audio logs, passively relaying a story to you in a way games have been doing for years now. But the clever thing about Tacoma is how they cover a large area, with conversations spread between many different rooms. Say you’re observing an argument between three people and one leaves the room. If you stick around you might hear them talking about her quietly behind her back. And if you decide to follow her, she might confide in someone in another part of the station about what just happened. This is a simple, abstract example, but other interactions are much more granular. I watch a couple holding hands, suddenly letting go when a fellow crew member appears from a nearby office. A tiny gesture that brilliantly illustrates, to my mind at least, their reluctance to make their relationship official. And the game is full of these fleeting, human moments, which really bring the characters to life. A recording may only last three minutes, but catching everything that occurs within that time-frame, from major story beats to these ephemeral character moments, will take much longer. Fullbright’s other great talent is building worlds. The attention to detail in Tacoma is extraordinary, encouraging thorough exploration of the station. Every object feels like it was placed with considered purpose, painting a vivid picture of the crew’s day-to-day lives. As well as creating a resonant sense of place, this also fleshes the characters out in subtle, intimate ways. Anxiety medication in a bedside table. A photo of a recently deceased relative hidden in a drawer, face down. A rejected job application angrily screwed up in a trash can. These understated touches humanise the crew, making them feel like real, flawed, fragile people, and I couldn’t help but get swept up in their lives. Fullbright also seems to have spent a lot of time thinking about the practicalities of how a station like Tacoma would operate, with a Kubrick-esque eye for detail. You get the sense that this is a functioning place and not just a plywood movie set, which only adds to the richness of the setting. I also love catching the occasional glimpse of the station’s vast, rotating rings through windows and skylights, reminding you of just how massive it is. And there’s something haunting about seeing Earth hanging in space, lonely and distant. You can just imagine the crew staring at it, yearning for the comforts of home. Like Gone Home, there’s a satisfying physicality to your interactions with the environment. You can grab hold of drawers and slide them out, pick objects up and examine them, and pull things aside to peek underneath. And I want to thank Fullbright for the ‘put back’ option, which lets you pick stuff up without leaving a mess of scattered physics objects in your wake. There aren’t any puzzles, although sometimes you’ll have to locate a key or code to access certain parts of the station. 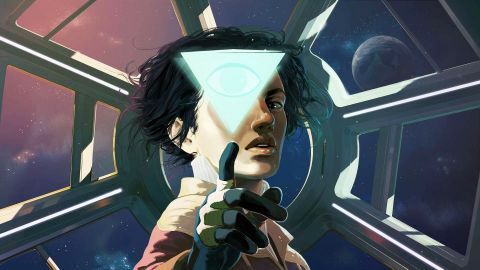 But, overall, Tacoma is more about storytelling and discovery than navigating levels and solving problems. People will pull up personal desktops during a recording, which you can access to see what they were looking at. I catch one crew member reading a trashy crime novel about an orbital casino heist while waiting for someone to get off the phone. Elsewhere a woman discusses her troubled relationship with an online therapist, and a man chases high scores in an AR videogame. There are a lot of jokes buried in these optional desktops as well, and it’s worth noting that Tacoma has a mischievous sense of humour that loosens it up and prevents it from ever becoming too saccharine or earnest. The first hour is pretty sedate, giving you space to observe and get to know the crew. But then, suddenly, an accident leaves the residents of Tacoma in a dire situation, and the rest of the game focuses on their attempts to deal with it. Seeing how each person copes with the stress of what’s happening is where some of the best drama emerges. It’s tense, fraught, and often heartbreaking. But the shift from watching people making cakes and playing pool to fighting for their lives is a little abrupt, and I would have enjoyed spending more time with the crew in happier times before the incident. A grander narrative begins to emerge as you journey deeper into the station, and it becomes about much more than the six people who lived there. Themes confidently tackled include the rights of sentient artificial intelligence and corporate versus human interest, which gives the story a very 1970s feel. It’s dark, thoughtful science fiction, dwelling on the perils and ethics of advanced technology and space colonisation. But while a lot of sci-fi from that era has a cold, nihilistic view of mankind’s place in the universe, Tacoma has a heart. The crew are the soul of the game, and even when things are falling to pieces, their innate humanity always shines through. By the time the credits started rolling I’d grown genuinely attached to these six unique people. I spent so long reading their emails, snooping around in their living spaces, and eavesdropping on their conversations that I felt like I knew them. And that made saying goodbye difficult. I missed them so much, in fact, that I immediately started a second playthrough. And there was unexpected value in that, because things I learned in my first run brought new context to certain events and conversations the second time around. There’s a lot going on in Tacoma, much of it subtle, hidden away, waiting to be uncovered. And in that sense, as a game about piecing together a story, it’s immensely rewarding. I won’t forget my time aboard that station any time soon, or the people whose lives I got hopelessly tangled up in while I was there.